MATTOON — Jacob Zike obviously did the sales pitch, while Jack Lapeyrouse was apparently the shy silent partner for their lemonade stand business last weekend at Lake Paradise. The 4-year-old entrepreneurs raised $42.50 in four hours while selling refreshments near the start of the garden walk sponsored by the First United Methodist Church of Mattoon. Their effort was helped by brilliant marketing, enhanced by their preschool cuteness, and great timing with hot, humid weather hovering over the area on the day of the garden walk. They raised the money for a good cause: other kids in need at Christmas time. Mattoon Police Department Deputy Chief Jason Taylor accepted the donation from the boys’ mothers, Deanna Lapeyrouse and Heather Zike, and other relatives Thursday on behalf of the Mattoon Police Cops for Kids charity, which buys toys and necessities for needy children and their families. Taylor said this was the youngest group of donors he recalls for the Christmas charity that accepts donations throughout the year. “It is unusual. We usually have business people offering donations. But these two are young entrepreneurs. This donation is a tribute to their parents,” Taylor said. As the officer talked, Jack of Mattoon kept to himself while Jacob of Savoy joked and played in the police lobby. 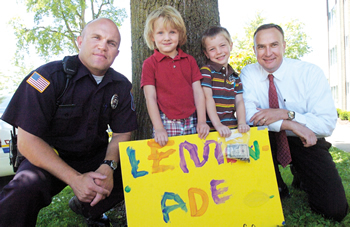 Carol Fuller, an adopted grandmother, proposed the idea for the lemonade stand offering its proceeds to Cops for Kids. “We thought it would be nice since they’re children giving to other children,” Fuller said. The boys did receive a reward for their efforts with a VIP tour of the Mattoon police station, including a trip to the holding cells, led by Taylor.